Data Points: Is it time to talk? 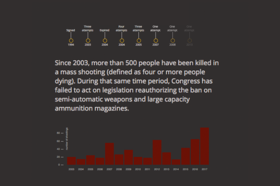 Since 2003, more than 500 people have been killed in a mass shooting (defined as four or more people dying). A 10-year federal ban on the manufacturing and sale of the kinds of assault weapons that have been used in the deadliest mass shootings in modern history was signed by President Bill Clinton in 1994, but was never renewed after expiring in 2004. Since then there have been multiple attempts to renew the ban, with such efforts usually occuring in the aftermath of a deadly event, but thus far all have failed to pass. ... Is it time to talk?